Yes, put a “0” at the place of the “1” in the $debug variable, at the begining of the plugin code ! In addition, I’ve created a clean installation on my Local server running TXP 4.5.4 (last version to date) and the plugin does not work neither. On remote server seems to work fine. My PHP version using XAMPP is PHP: 5.4.7 in case it helps. I use this plugin on all my sites, and it’s the first time an error occurs. 5.4.4-10 = PHP with the error (SimpleHosting on Gandi.net). Here, my workaround remove the warning, not the error ! I try this, next a few google search on this particular error. Now, I’m in the process to move to the new abl_droploader plugin. One request : be able to create a new category before uploading images ! I use smd_thumbnail and I see the abl_droploader create all the thumbnails for the images uploaded !!!! Thanks Stef, thanks abl_droploader author ! I stopped checking up on this forum (and the plugin) years ago. I’m surprised it is still in use. Removed all the options. I figured, they were kind of pointless anyway. If you want, you can test the version, create issues on GitHub and contribute. I have used this plug in to load plenty of images, maybe 2000, often in 20 – 30 batches. It stopped working recently, getting a security error. Not good. This latest version now works perfectly. Being able to create new image categories before uploading is a major plus. I just uploaded 43 images in one batch flawlessly, I think the version I was using had a 20 image limit. I’m one of the no doubt many who are grateful for your plugin. Thanks for your efforts, I guess often we are silent when we get something that just works. I already use this plugin for a long time, and now I was very inquisitive about the new version for TXP 4.5.5.
and the error message: Some errors Were encountered. 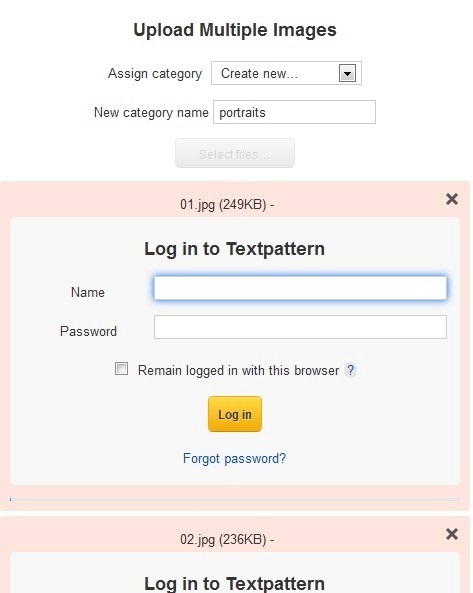 Check the above errors, then reload the page to see your successfully imported images. Have you any idea what´s wrong? Thanks for help. Hi, I have tested the new version of the very useful plugin again. Batch upload works perfectly, but images after import are not assigned to author and no exif data are used.